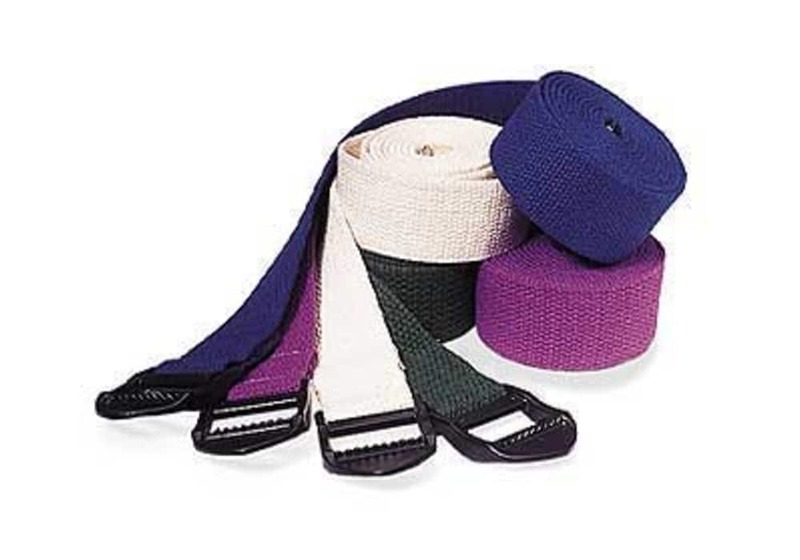 Each yoga strap is made of a cotton/synthetic blend. These straps are 1.5" wide and are available in two styles - with cinch buckles or d-ring. The D-Ring straps have metal D-rings on one end and can be easily fastened. Yoga straps allow you to stretch yourself to the limit. Each yoga strap is 6' or 8' long and made of a cotton/synthetic blend. These straps are 1.5" wide and are available in two styles - with cinch buckles or d-ring. The cinch buckle straps have a convenient, black, hard plastic buckle on one end and nickel tip on the other end for easy threading. Once in position, the cinch buckle holds securely, and its unique design provides an easy release. The D-Ring straps have metal D-rings on one end and can be easily fastened. Choose from four colors: Navy Blue, Purple, or Black.